I made this frittata for Mother’s Day and it was a hit – except for the 11 year old who doesn’t like stinky cheese and my sister’s 24 year old boyfriend… who also doesn’t like stinky cheese. Haters gonna hate. The frittata is a spin-off of a great restaurant here in Portland that is renowned for their weekend brunches. In fact, it’s usually an hour wait minimum on the weekends. Ouch, right? But in all seriousness, we love our brunch in Portland. So much so that they made a Portlandia skit about us. So yea. Apparently we’ll do just about anything to get to a good brunch place. 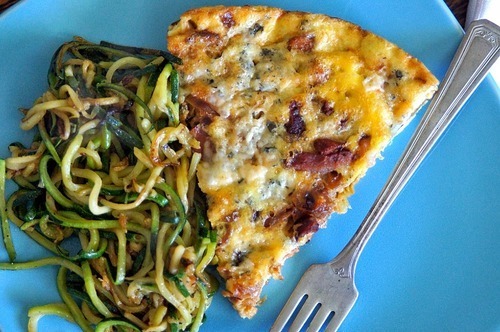 Okay, so this frittata. It’s so easy. As are most frittatas. The main specialty item you will need is a well-seasoned cast iron pan (which should be a staple in any kitchen anyway) or a skillet that can go in the oven. Choosing a mild Gorgonzola is key. It’s a stinky cheese and can easily overpower other flavors. I talked to the cheese counter dude at the local cheese shop… okay. New Seasons. I talked to the guy at New Seasons. I’m not that fancy, even though there are some FANTASTIC cheese shops in the Portland area. But, cheese people – they know their cheese. Tell them you’re making a frittata and want something mild that won’t magnify in the oven. They’ll know exactly which cheese to set you up with. If they don’t, find a new cheese guy. 🙂 If you’re doing level 3 of the 21 Day Sugar Detox, omit the cheese and also omit if you’re dairy free. Finally, make sure you don’t toss your excess butter – by the time you’re done caramelizing the onions, it will be infused with onion goodness. It’s what makes this dish fantastic – that and the bacon and cheese. Preheat oven to 400 degrees Fahrenheit (wait until onions are almost done, it could take a while). In an 8" (or wider if your skillet is shallow) cast iron skillet, and over medium-low heat, melt the ½ cup of butter. Add onions and saute until onions are caramelized (see link if you need a great how-to from The Kitchn). Remove onions and set aside, being careful to keep as much of the butter as you can in the pan. Swirl the butter around so it coats the bottom and all of the sides of the pan. While pan is hot, pour in beaten eggs. “Sprinkle” carmelized onions, bacon and crumbled Gorgonzola on top. Place in the oven and bake for 8-10 minutes, or until a knife in the middle comes out clean. Set aside and allow the eggs to set. Cut like a pie and serve warm. 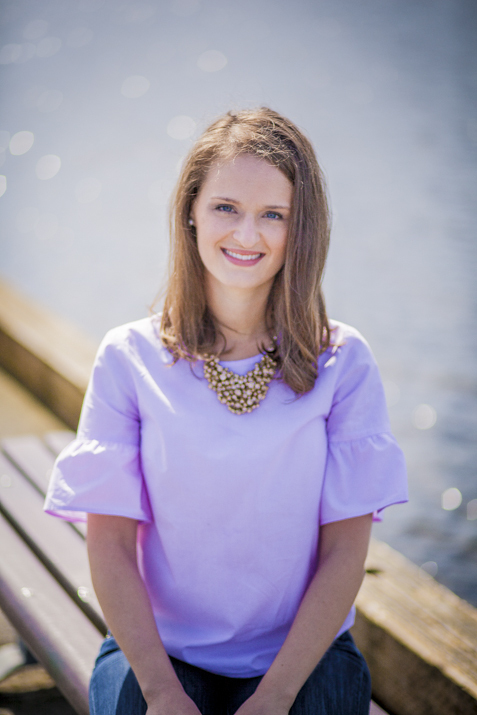 I know I get a few weird looks from some of my roommates (that’s right – I see you ladies) as I’m cooking my eggs in lard every morning or when I’m dumping a tablespoon of Kerrygold butter into my coffee and blending it into a delicious smooth and creamy latte. The amount of fat I consume any given morning is enough to make my college nutrition professor cry… or rescind that A I got in her class and give me an F.
So, why do I do it? Fruity pebbles sound so much better, right? Okay, I just made myself gag. Saturated Fat is a good source of energy. No, seriously. I know this goes against anything you’ve ever learned concerning nutrition but it’s true. Fat takes the longest time to break down in your system, giving you sustained energy throughout the day. In fact, fat provides twice the chemical energy per gram as compared to carbs and proteins. Think of it this way: if you eat Fruity Pebbles for breakfast, do you ever really eat the recommended daily value and feel full and have lasting energy? I mean, really? Probably not. If you’re like most people, you’ll have quite a few bowls and then half an hour later after feeling like you could run a few dozen times around the block, you have a mega sugar crash, right? Sugar breaks down immediately in our system and is used quickly as the conversion process to a usable sugar type is immediate. Fat on the other hand, takes lots of time and energy (I’ll touch on this one in a bit) to break down into a usable sugar that the body can metabolize. Thus, it leaves you feeling full longer and gives you more energy to seize your day. It’s provides cellular protection. For all the crap that it gets, I’m always amused at the gaping holes (pun intended) in nutrition and science. Human cells need fat in order to survive. We have this thing called the lipid bi-layer, also known as a plasma membrane, that acts as the first line of defense for our cells. In other words, the plasma membrane is our cell walls (we’re not plants so technically we don’t have cell walls but you get my point). So the old adage “you are what you eat” rings true with this one. 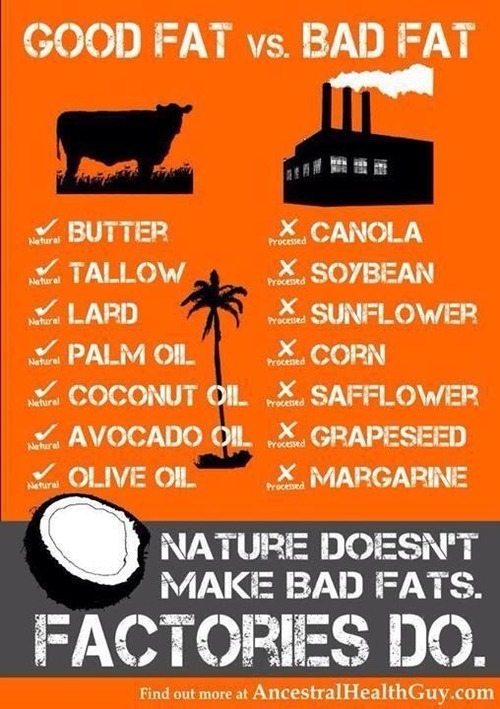 If you consume poor quality fats, what are you giving your cells to work with? (hint: the answer is poor quality cells) They simply don’t have the materials they need to keep a strong defense up, allowing themselves to become susceptible to mega-molecules which disrupt cellular function, disease, infection, mutation, poor cellular replication, death, etc. 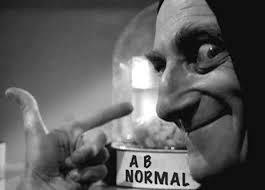 Vitamins, anyone? Proper fats help facilitate the absorption of vitamins A, D, E and K.
No insulin spike to digest. I love this reason. In modern times, we’re so used to starting off our day with a massive insulin spike. Going back to my Fruity Pebbles example, starting your day off with a high-carb/sugary meal sets you off on a massive roller coaster. We’ve all experienced days of highs and lows. And they’re not fun you so know EXACTLY what I’m talking about. Eating a healthy dose of fat for breakfast keeps us on an even playing field until we’re ready to eat again. And, it will be a while – it’s noon and I’m still feeling as content as I was when I ate at 7:30 this morning. So what’s my take home? Starting your day off with a good portion of healthy fat is not just nice (let’s face it – fat tastes good) but it’s necessary for long-term health. 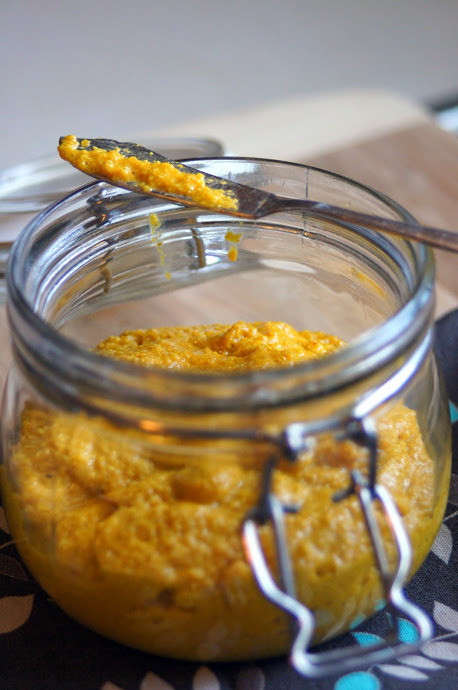 Pasture-raised corn/soy-free organic eggs… cooked in lard. Fatty meats – like chicken thighs… cooked in lard. 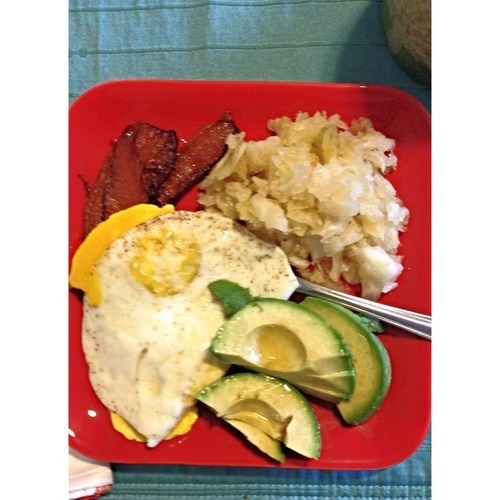 And pulling it all together, this morning I had bulletproof coffee, half an avocado, two eggs fried in lard and three slices of bacon with a healthy side of my homemade sauerkraut. This pic isn’t the best but here’s what the plate looked like. Cheers to your health! And to enough energy and mental clarity to more than get you through your day! It’s a skill that I’ve taken for granted. This is seriously one of the easiest things in the world. So if you’re new to the world of primal food preparation or fermenting, this is a good starting point. Full-fat organic plain yogurt. I use Nancy’s Organic Whole Milk Yogurt. You DO NOT want to use anything that is fat-reduced. Why? Because I said. Okay, it’s because reduced-fat milk products replace the fat with additives – like sugar and dried milk (which is bad for you). So stick with the full-fat organic plain yogurt that has absolutely nothing in it. Organic Muslin. Cotton is GMO’d here in America and in India and they use crazy amounts of pesticides on it. You’ll pay more for organic but it’s worth it, especially if you have your food sitting in it for extended periods of time. I’ll buy a few yards at a time and keep it on hand in my ever-growing fabric stash. A large jar or a deep bowl. I buy my honey by the gallon and save the jars for future use. They’re just so so handy. Especially when you need something to hang your yogurt bag off of and don’t feel like cleaning up whey splash in the morning. Enough about that, here’s the complete tool list and the how-to for…. One 32-ounce tub Nancy’s Organic Whole Milk Yogurt (can use a half tub, I’d rather get it all done with right then). A few large rubber bands – like the ones that hold broccoli heads together. If you don’t save them, start doing it. Or, you’ll need lots of string. Organic muslin or a thin dish towel – no terry cloth towels! Drape the fabric/towel over the bowl and empty the yogurt tub into the middle. Bring up the corners and secure with the rubber band or a string. 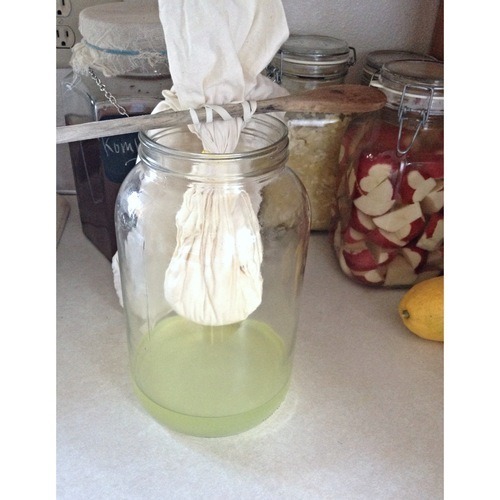 Either secure yogurt bag off of a cupboard handle (if you have one) with a string, with bowl underneath to catch the dripping liquid -OR- using another rubber band, secure a wooden spoon to the bag and hang over bowl, having enough clearance to not let it sit in the whey that will be catching at the bottom. Set out overnight, or until the bag is no longer dripping. You will have about 2 cups of whey and 2 cups of cream cheese. Store whey in a sealed glass container for up to 6 months, use it for a Beet Kvass or Lacto-Fermented Ketchup starter and for many more ferments coming soon to Northwest Primal. And that’s it! It’s so easy! This recipe is inspired by David Lebovitz, a Paris transplant chef whom I absolutely adore. He made a homemade mustard based off of another homemade mustard recipe so I thought I’d give it a try. I’m sure by now, with my Lacto-Fermented Ketchup and Homemade Mayo, that it may have crossed your mind that I’m working on building up my collection of homemade condiments. And that would be correct. It’s just so easy to walk the two blocks to Safeway (the store I refer to as the glorified 7-11) and pick up a thing of whatever mustard I want. Problem is, I can’t track the ingredients – there’s gluten in some of the vinegars, random chemical fillers and is that plastic bottle really BPA-free? 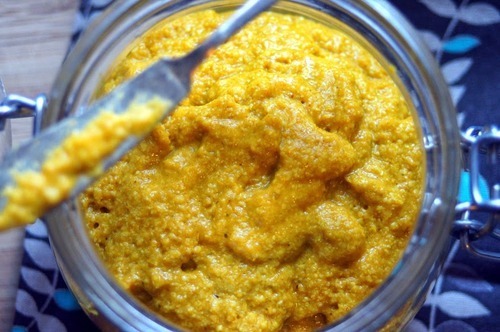 So, homemade mustard it is! Anyway, here’s a basic yellow. I can’t wait to grill up some brats on my BBQ and have some kraut and mustard! In a stainless-steel bowl (anything else will stain, trust me), combine all ingredients, except water, and stir until blended. Set aside, covered with a towel, for two to three days. Blend in blender until smooth, adding a little bit of water if mustard is too thick. No, I’m not talking about the rocker-turned-famous-ballad-singer who’s music video is five parts creepy and three parts even creepier. I’m talking about stick to your ribs meatloaf. The American classic. And the thing of many jokes. I decided to make meatloaf before I knew it was going to be 75 here in Portland over the next few days. Had I known, I would have turned the two pounds of ground beef I pulled out of my freezer into taco meat or hamburgers to be served in a lettuce wrap. As it stands, meatloaf isn’t all that bad and I’ll probably crumble it up and serve it on salad (because it’s 75…. and that’s warm for this area). 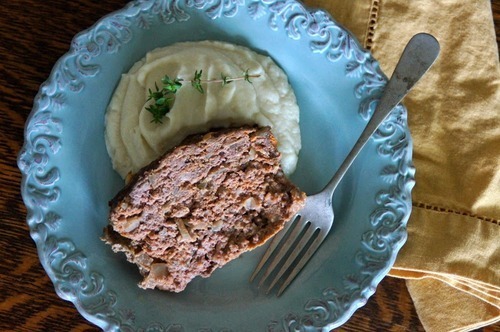 Good thing this meatloaf is fantastic and super easy. I even gave my roommate a sample (she really has the best job ever of being my taste tester… except for when things don’t work out) and she said it was fantastic. And then went back for an even bigger second sample. So, here ya go. 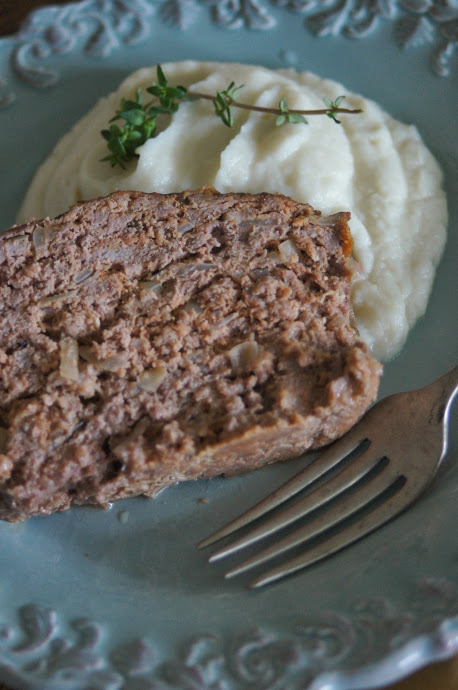 Super easy meatloaf – that’s bread/gluten/grain free and full of whole foods goodness! Note: when buying sausage, make sure you check for additives. A lot of prepared meats will have extra stuff in it that’s not good (gluten and sugar are a big one). Talk with your butcher about what goes in it. A safe store to buy from is Whole Foods – their corporate recipe for Italian sausage is good, with no added crud. With clean hands, mix two types of meat in a large bowl. Add onions, egg and coconut flour and continue to mix the meat. Add ketchup and spices and mix. Pour into a loaf pan and pat until the surface is even. Bake for 50-60 minutes, or until the internal temperature reaches 160 degrees Fahrenheit. Remove from oven and let sit for a few minutes, allowing juices to settle. Serve hot. This recipe is a basic seasoning for one pound of ground chicken or pork. Recipe can easily be doubled, tripled, etc. and stored in a sealed glass container for later use. Crush anise seed (either place in a ziploc bag and roll over with a rolling pin or use a mortar and pestle). Mix ingredients in a bowl prior to mixing with 1 (one) pound ground pork or 1 (one) pound ground chicken. Note: If you have already prepared a large amount of the spice blend ahead of time, use only 3 tsp. Some people are the ketchup with fries people. And I have yet to understand them. I’ve always been the fries with ketchup person. As in, yes. I did just go through half a bottle of ketchup in one sitting, why do you ask? Kind of person. So when I started becoming more aware of what I was eating in ketchup – high-fructose corn syrup, corn syrup solids, additives, “natural flavors” – whatever those mean, MSG, gluten (WHY does gluten have to be in ketchup?!) and random chemicals that even my five hundred courses in biology, chemistry and nutrition didn’t set me up to understand, I knew it was time to look elsewhere. I tend to stay away from Heinz and Hunt’s – I disagree with their use of and support of GMO products and their lobbying against a consumer’s right to know what’s GMO and what’s not GMO. Even though both make an organic line for the more conscientious consumer, I just can’t bring myself to support them and take my business elsewhere. 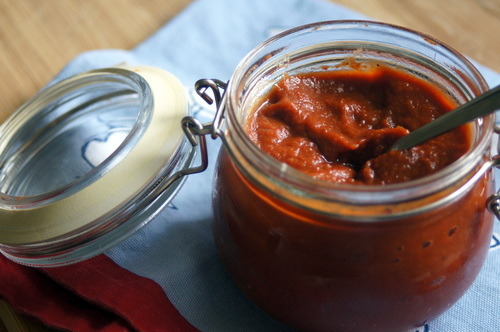 So, what makes lacto-fermented ketchup so good? For starters, you can put your own spices in it. 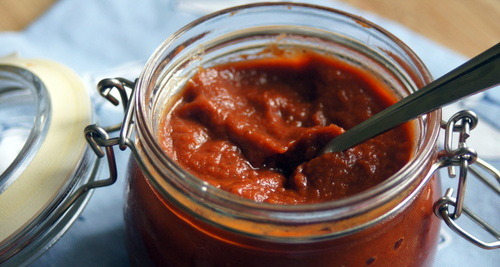 I like things to be a bit more zesty and put a dash (or two) of cayenne pepper in my ketchup. So. Good. And even better when used for meatloaf. Or tossed in spaghetti sauce. Or as a BBQ base. Or as a cocktail sauce base. Or fry up some of my Fermented Red Potatoes with some Fermented Garlic and onion and top with ketchup. Or as a dipping sauce for my Adobo Sweet Potato Fries. I’m getting hungry just thinking about it. It’s not overly sweet. I emphatically dislike ketchup brands that seem like you’re munching on a sugar cube. This ketchup is tangy. The bacteria feast on the maple syrup, making it lower-glycemic than most ketchup. It’s full of probiotic goodness. If I’m going to eat something, it might as well taste absolutely FANTASTIC and be healthy for me. There’s millions of healthy little buggies that aid in digestion in this stuff. For this girl, who can’t metabolize tomato all too well, coupling ketchup with probiotic goodness provides my system with the necessary buggies to ensure good absorption and assimilation. Mix all ingredients in a bowl until well blended. Pour into a clean glass jar and seal. Let sit on the counter for two to five days – do not open. Move to the fridge and let it sit for another week. It should smell like ketchup and taste tangy. If it smells off or has grown any mold, pitch it immediately. 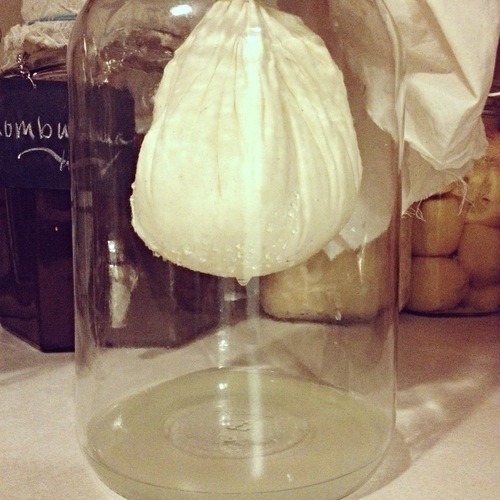 However, if your starter culture is alive and active (the sauerkraut juice or the whey), you’re good to go! Stores in the fridge indefinitely. No meat products, whatsoever…. minus fish and shellfish. Following? K. Good. The rules are simple… thankfully. I wanted to sneak in some bacon fat… but didn’t want to risk it. And, I really wanted something I could eat for a change. (It’s not usual that I get to eat at a church gathering.) So, rather than buy something pre-made from the store as was suggested (ew! Why would I do that to people?!?!? ), I decided to toss some veggies together with a few spices and call it good. Oh, and I tossed in some red pepper flakes? Why? Because I can. And I like to keep people on their toes. Note: I HATE cutting up veggies for soup. A few years ago, I bought a veggie cuber thingy. 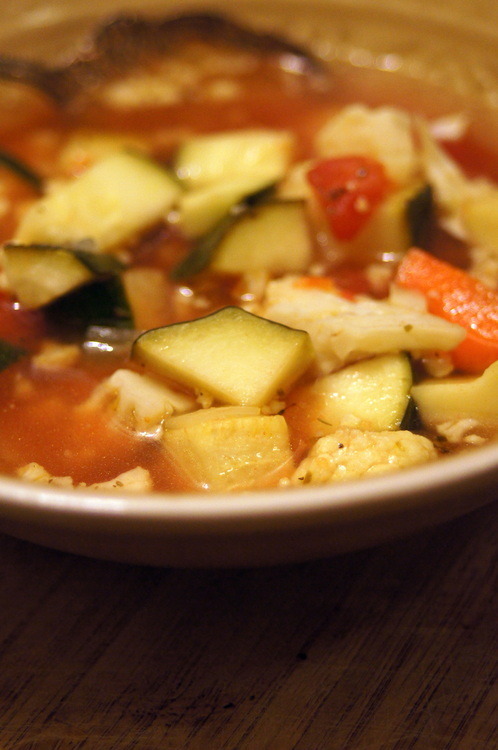 I use it so so so much in the summer when I’m making cucumber and tomato salads or have a bunch of onions to quickly cut or… am making veggie soup. It’s somewhat of a pain to clean as the blades are super sharp. (I’ve been known to kill my finger a few times on it.) But after a while, I’ve learned a technique that works for me. Anyway, it’s not one of my favorite gadgets but for stuff like this, I highly recommend it (especially if you have a BB&B 20% coupon). In a medium sized stock pot, saute onions in EVOO over medium heat until translucent. Add garlic and continue to saute for another minute. Toss in carrots and cauliflower and sautee until tender. Add zucchini and stir. Let sit for another three to four minutes. Add tomatoes (and all of their juice!) and water. Stir and add spices. Simmer over medium-low for half an hour, or until veggies are cooked. Salt and pepper to taste. Serve immediately.